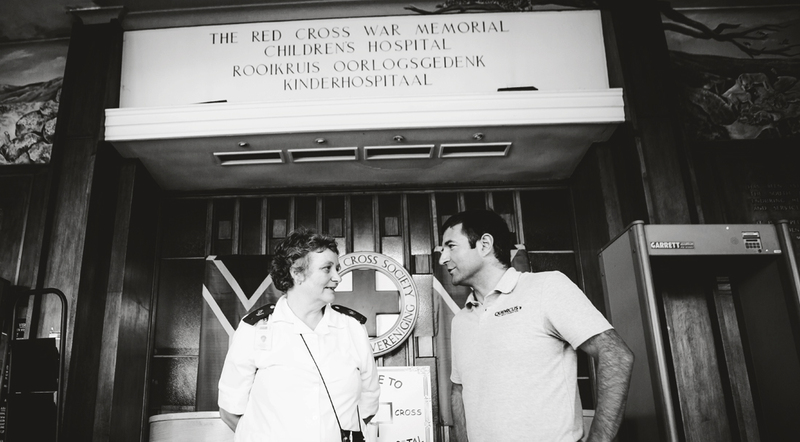 The Red Cross War Memorial Children’s Hospital in Cape Town is one of the leading children’s hospitals in the world and the largest stand-alone paediatric hospital in sub-Saharan Africa, renowned for its treatment, research and training programmes. The majority of the hospital’s patients are from exceptionally poor and marginalised communities in the Western Cape Province and one third of patients are younger than one years old. Optimised care for children with HIV with a less than 15 per cent mortality rate whereas previously most children with HIV died. However, the PICU is chronically under-resourced and is in desperate need of further investment. With over 1.7 million children in the Western Cape, the number of cases referred to the hospital has increased dramatically in the last decade, as has the corresponding number and complexity of paediatric intensive care cases. Currently, there are not enough paediatric intensive care beds, within the Western Cape. The current PICU at the Hospital has 22 of those beds with close to 100% occupancy. The demand for a bed has reached a point where many children each year have had their scheduled surgeries cancelled as a result of the shortage of space. How will the Quercus Foundation address this need? Creating a workshop for repairs and storage space for Clinical Technologists and specialised equipment. Meet two incredible children we shared time with at Red Cross War Memorial Children’s Hospital in Cape Town. Three-year old Limile Tsodo was born with kidney dysplasia and needs a new kidney. He has already been admitted to the PICU three times, most recent for a week following an operation on his parathyroid glands. After each operation, Limile needs to be in an isolation ward to prevent infection, however, as there are none, he is admitted to the smallest ward to try and protect him. Limile may be physically tiny but he already speaks three languages and has an impressive grasp of medical vocabulary thanks to his time in hospital, which has become a second home for him and his whole family. For them it is a waiting game of ventilators, needles and dialysis until a kidney becomes available. Luckily for him, as his father Luthando says: “It is a privilege for Limile to be treated here where there is such demand for beds. We are very aware of the severity of his kidney problems, but we put our hope in the doctors and pray. The doctors and nurses are very passionate about what they are doing and they have our utmost respect and support”. 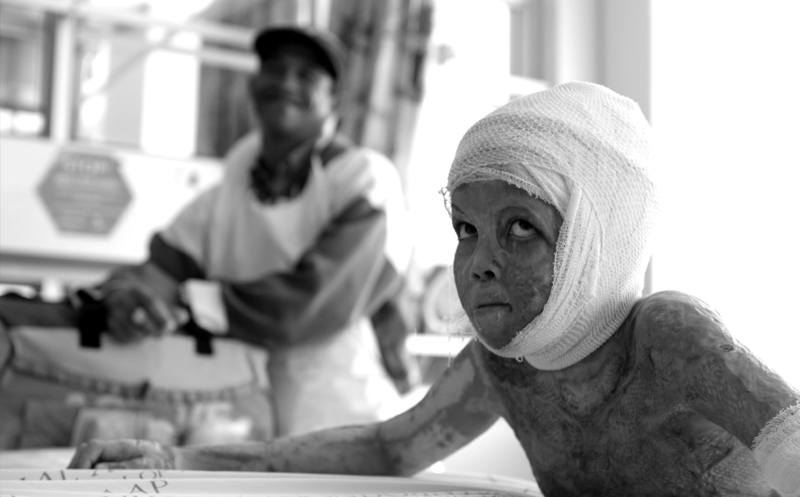 Me-Kyle Samson spent over three weeks in the Paediatric Intensive Care Unit (PICU) with 40% burns over his head, chest and legs. He needed isolation for protection against cross-infection and other children from the trauma of witnessing his extreme distress as doctors washed, cleaned and dressed his wounds. Karel kept vigil 24/7, joined at the weekends by Me-Kyle’s mother. They were dependent on the desperately inadequate facilities for families who are trying to look after their children whilst managing their own shock and trauma. There are so few beds for parents for a ward of 22 patients. Otherwise, it’s a stool next to the patient’s bed or a dark, dreary parent’s waiting area. Several months later and Me-Kyle is still a resident at the Hospital. He now accompanies doctors on their rounds and has become something of an expert of burns dressings (even offering advice to the doctors!) Ask him what he wants to be and he will now tell you a ‘Professor of Medicine’. 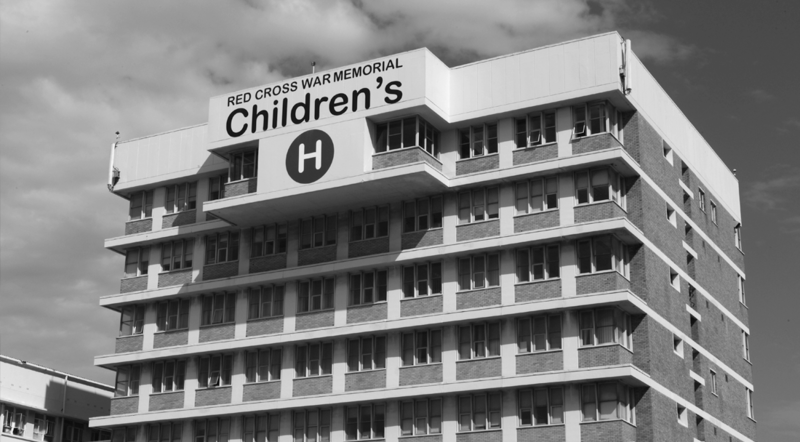 The Red Cross War Memorial Children’s Hospital is Southern Africa’s largest, stand-alone tertiary hospital dedicated entirely to child healthcare. It is a centre of excellence for the training of all categories of child health professionals, and widely regarded as South Africa’s leading centre for postgraduate specialist paediatric medical and surgical training. The Children’s Hospital Trust was founded in 1994 to fundraise for the Red Cross Children’s Hospital when it was threatened with closure due to lack of funding. Since its inception the Trust has supported the Hospital through upgrading its buildings, purchasing vital equipment and funding critical training and research programmes. The Breatheasy Programme is a unique specialist nurse-led initiative at the Red Cross Children’s Hospital that empowers parents of children reliant on a tracheostomy or artificial ventilation for breathing to provide safe care for children at home. Tracheostomy patients around the world characteristically face lengthy hospital stays. Through careful training and support of families, the Breatheasy Programme ensures that children with Tracheostomies instead return home to their families and communities, as soon as they are medically stable. Once home, they are monitored as outpatients by the programme, while family members take responsibility for routine day-to-day medical care. It is led by founder and specialist paediatric nurse, Sister Jane Booth, who co-ordinates a multi-disciplinary team of Healthcare professionals. Whilst in Cape Town, we met a little girl called Pam who was reliant on her breathing device in order to lead a semi normal life. She was born with a condition called biliary atresia, a blockage in the tubes carrying bile from the liver. After an unsuccessful Kasai operation to try to correct this function, Pam was left with a life-threatening liver dysfunction. Associated with this, Pam not only developed rickets but also an inability to move her chest naturally, causing respiratory pump failure. Pam entered the Breatheasy programme in March 2013 after she was given a tracheostomy to improve her comfort for ventilation. Thanks to the excellent treatment from the Red Cross Children’s Hospital in CPT, she was put on a breathing machine to aid her breathing and went from strength to strength. Her mother Charmaine gave up her employment to be with her 24 hours a day. Thanks to Sister Jane Booth, her team and the Breatheasy programme Pam was able to thrive and enjoy her parents and siblings in her own home environment, which we were also grateful to personally experience with her in 2014. On the 11th February 2015 Pam was weaned of the ventilator and decannulated. She was walking, talking and playing! Pam was back on the list waiting for a suitable liver, when she was taken ill.
On the 15th June 2015 Pam lost her battle and passed away. Pam had developed a severe chest infection and was transferred to the ICU. We are deeply saddened for the loss of our beautiful Pam. What warms our hearts in her memory, is that she was afforded a much better quality of life thanks to the pulling together of so many caring people and that she was able to spend quality time at home with her family. The Breatheasy Programme was covered by BBC Worldwide as one of the eight most innovative programmes being run in Africa. See Pam’s story below.